Endothelial-dependent coronary artery vasoreactivity is an important indicator of vascular function and predicts cardiovascular events . In response to endothelial-dependent stressors, changes in coronary artery cross-sectional area and flow velocity occur which are typically assessed by invasive methods. Magnetic resonance flow mapping is non-invasive and validated for endothelial-independent stressors in humans by comparison with Doppler guidewire measurements [2, 3]. One prior study , performed at 1.5 T and recording 7–11 cine frames per cardiac cycle, assessed coronary flow velocity during isometric handgrip exercise, a well-established provocateur of endothelial-dependent vasoreactivity . As higher magnetic field strengths offer the potential for enhanced temporal and/or spatial resolution, which would support both improved image quality due to reduced blurring and more accurate quantification of diastolic peak velocity, we studied diastolic coronary flow peak velocity with 3 T MRI using spiral acquisitions. Here we describe reactive changes in coronary flow velocity using isometric handgrip exercise in healthy subjects as detected by spiral 3 T MRI with a temporal resolution of 34 ms and an in plane resolution of 0.8 × 0.8 mm. We enrolled 9 healthy subjects (4 women) of average age 33.8 ± 8.0 (mean ± SD) years. Each subject was placed prone in a 3 T MRI scanner (Achieva, Philips, Best, NL) using a 6-element cardiac coil for signal reception. Scout scans were performed to determine the 3D course and orientation of the proximal right coronary artery (RCA). Baseline coronary velocity measurements were obtained using a VCG triggered breath-hold (11–23 sec) velocity-encoded spiral cine sequence perpendicular to the RCA (FOV = 250 × 250 mm2, matrix = 312 × 312, spatial resolution = 0.8 × 0.8 × 8 mm3, TR = 34 ms, TE = 3.5 ms, RF excitation angle = 20°, spiral acquisition window = 27 ms, spiral interleaves = 11, VENC = 35 cm/s). After baseline imaging, each subject performed isometric handgrip for 3.5 min at 30% of their maximum grip strength on a non-magnetic, handgrip dynamometer . Coronary velocity imaging was performed 30 seconds into the handgrip stress and was repeated at 3.5 minutes (Figure 1). After cessation of the handgrip stress, images were acquired at regular intervals for 12 minutes of recovery. Both the blood pressure and the heart rate were recorded at rest and during handgrip. The images were analyzed (FLOW Version 3.0, Medis, NL) and peak diastolic coronary flow velocity was computed as the difference between the velocity measured in the coronary artery lumen and that from the adjacent right ventricle. Cross-sectional images of RCA in a subject during velocity-encoded MRI at stress. Velocity map (A) showing darker pixels in the RCA that are indicative of high velocity. Spiral cine image (B) of the same patient at a similar time point during stress. All of the volunteers but one had sufficient image quality during isometric exercise; however, data at one minute of recovery were only obtained from 6 subjects. There was sufficient image quality for analysis at all other time points. The mean percent increase in rate pressure product with stress was 25.0 ± 16.1.% (p = 0.001 vs. baseline). Isometric handgrip stress induced significant increases in peak diastolic coronary flow velocity (baseline 26.8 ± 9.3 cm/s vs. stress 37.0 ± 12.8 cm/s, p = 0.002). 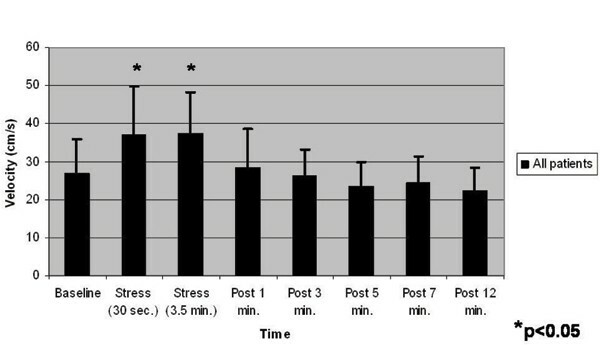 The average percent increase in peak velocity with stress was 38.1 ± 20.7% at 30 seconds and 39.6 ± 28.4% at 3.5 minutes. Following completion of the stress protocol, the peak diastolic velocity at 1 minute recovery returned towards the baseline velocity (N = 6, baseline 23.0 ± 6.2 vs. 28.3 ± 10.5 cm/s, p = 0.11) and at all subsequent time points, there were no significant differences between baseline and post-stress peak diastolic coronary velocities (Figure 2). The mean coronary flow velocity reserve (= peak diastolic velocity during stress/velocity at baseline) for all subjects was 1.53 ± 0.29. Peak diastolic coronary flow velocity versus time. Peak diastolic coronary flow velocity before (Baseline), during (Stress), and after (Post) isometric handgrip exercise (N = 8). 3 T spiral MRI enables the quantification of coronary flow velocity changes in response to endothelial-dependent stress with both high temporal (34 ms) and spatial resolutions. In healthy adults, isometric handgrip causes significant changes in peak diastolic coronary flow velocity that occur early (30 sec) and do not change further during the ensuing three minutes. Coronary flow velocity returns to baseline only 1 min after the cessation of handgrip. The present findings warrant further studies using this technique in patients at high risk for coronary artery disease and those with suspected endothelial dysfunction.